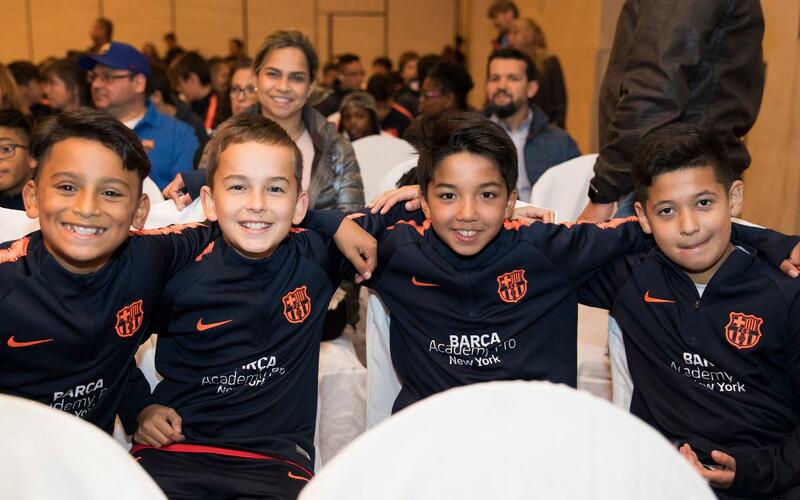 The Barça Academy Pro NY’s second season in existence began with a presentation for the players and their parents in a hotel in Hauppauge, NY, on Long Island. In addition to the speeches by the Local Project Directors, Domènec Guasch and Marc Velasco, the Academy’s Ambassador, the American international Allie Long, also took part in the first day’s of events. The sessions brought together about a thousand people, who had the opportunity to learn more about the Barça Academy project, the FC Barcelona playing methodology, and some of the activities that will be carried out throughout the season, such as the Barça Academy World Cup, the annual international tournament that will take place in Barcelona next April. Meanwhile, Long also wanted to be part of this presentation by talking about her own experience as a player born and raised on Long Island who has reached the highest levels of the sport. Long explained how the Barça Academy Pro NY can help with the development of football on Long Island. The Seattle Reign player recognized that "it is very special to be part of the Barça Academy, because, in addition to helping improve football in my country, I am learning a lot." Long is also aware of the strength of the project and said she loves "the way in which the Barça methodology is explained, and the values and vision of the players around the world. It is not just about educating the players, but also doing it with the parents. If parents have more knowledge of the game, it allows them to help their children on the road to success and teaches them to trust those who are training them".